The occupation of the Baltic states involved the military occupation of the three Baltic states—Estonia, Latvia and Lithuania—by the Soviet Union under the auspices of the 1939 Molotov–Ribbentrop Pact in June 1940. They were then incorporated into the Soviet Union as constituent republics in August 1940, though most[quantify] Western powers never recognised their incorporation. On 22 June 1941, Nazi Germany attacked the Soviet Union and within weeks occupied the Baltic territories. In July 1941, the Third Reich incorporated the Baltic territory into its Reichskommissariat Ostland. 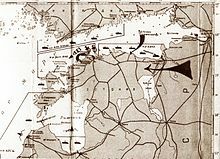 As a result of the Red Army's Baltic Offensive of 1944, the Soviet Union recaptured most of the Baltic states and trapped the remaining German forces in the Courland pocket until their formal surrender in May 1945. The Soviet "annexation occupation" (German: Annexionsbesetzung) or occupation sui generis of the Baltic states lasted until August 1991, when the three countries regained their independence. In its reassessment of Soviet history that began during perestroika in 1989, the Soviet Union condemned the 1939 secret protocol between Germany and itself. [need quotation to verify] However, the Soviet Union never formally acknowledged its presence in the Baltics as an occupation or that it annexed these states and considered the Estonian, Latvian and Lithuanian Soviet Socialist Republics as three of its constituent republics. On the other hand, the Russian Soviet Federative Socialist Republic recognized in 1991 the events of 1940 as "annexation". Nationalist-patriotic Russian historiography and school textbooks continue to maintain that the Baltic states voluntarily joined the Soviet Union after their peoples all carried out socialist revolutions independent of Soviet influence. The post-Soviet government of the Russian Federation and its state officials insist that incorporation of the Baltic states was in accordance with international law and gained de jure recognition by the agreements made in the February 1945 Yalta and the July–August 1945 Potsdam conferences and by the 1975 Helsinki Accords, which declared the inviolability of existing frontiers). 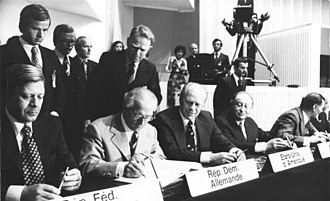 However, Russia agreed to Europe's demand to "assist persons deported from the occupied Baltic states" upon joining the Council of Europe in 1996. Additionally, when the Russian Soviet Federative Socialist Republic signed a separate treaty with Lithuania in 1991, it acknowledged that the 1940 annexation as a violation of Lithuanian sovereignty and recognised the de jure continuity of the Lithuanian state. ^ Davies, Norman (2001). Dear, Ian, ed. The Oxford companion to World War II. Michael Richard Daniell Foot. Oxford University Press. p. 85. ISBN 978-0-19-860446-4. ^ Quiley, John (2001). "Baltic Russians: Entitled Inhabitants or Unlawful Settlers?". In Ginsburgs, George. International and national law in Russia and Eastern Europe [Volume 49 of Law in Eastern Europe]. Martinus Nijhoff Publishers. p. 327. ^ Indrek Paavle, Peeter Kaasik (2006). "Destruction battalions in Estonia in 1941". In Toomas Hiio; Meelis Maripuu; Indrek Paavle. Estonia 1940–1945: Reports of the Estonian International Commission for the Investigation of Crimes Against Humanity. Tallinn. pp. 469–493. ^ a b c Yaël, Ronen (2010). "Status of Settlers Implanted by Illegal Territorial Regimes". In Crawford, James. British Year Book of International Law 2008. Vaughan Lowe. Oxford University Press. pp. 194–265. ISBN 978-0-19-958039-2. ^ Mendeloff, David (2002). "CAUSES AND CONSEQUENCES OF HISTORICAL AMNESIA The annexation of the Baltic states in post-Soviet Russian popular history and political memory". In Kenneth, Christie. Historical injustice and democratic transition in eastern Asia and northern Europe: ghosts at the table of democracy. RoutledgeCurzon. pp. 79–118. ISBN 978-0-7007-1599-2. The background of the occupation of the Baltic states covers the period before the first Soviet occupation on 14 June 1940, stretching from independence in 1918 to the Soviet ultimatums in 1939–1940. 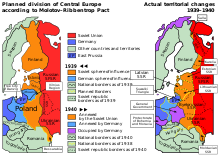 The Baltic states gained their independence during and after the Russian revolutions of 1917 and they managed to sign non-aggression treaties in the 1920s and 1930s. Despite the treaties, the Baltic states were incorporated into the Soviet Union in 1940 in the aftermath of the German–Soviet pact of 1939. 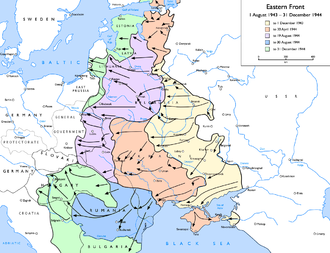 The Russian Empire acquired the Baltic areas as autonomous Duchies administered by Baltic German nobility via the Treaty of Nystad in 1721, in 1914, World War I broke out and by 1915 German armies had occupied Lithuania and Courland incorporating the areas into Ober Ost. As the Russian Empire began to collapse, independence movements sprung up on many regions. Later in 1918, the area was drawn into the Russian Civil War and proclamations of independence were issued in Lithuania on 16 February, in Estonia on 24 February, between years of 1918–1920, the bolsheviks tried to establish Soviet republics in the Baltic area. 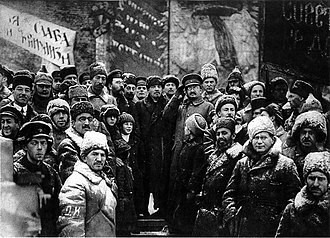 In November 1918 the Red Army conquested Narva and they proclaimed the Commune of the Working People of Estonia, but it was able to function only for six weeks. In December, the Latvian communists controlled Riga and proclaimed the Latvian Socialist Soviet Republic, in May 1919, the communist control ended when the city was taken by combined German and White Russian troops. By 1920, German troops had withdrawn and the Russian Civil War was in its final phase, the Baltic states signed peace treaties with Soviet Russia. Estonia signed the Treaty of Tartu on 2 February, Lithuania signed the Soviet–Lithuanian Peace Treaty on 12 July, in 1920, all three Baltic states adopted constitutions including universal suffrage, a multi-party system and parliamentary with a president. 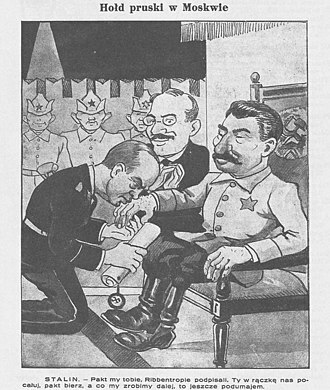 However, the communists were prohibited from participation in politics, the Bolsheviks could not prevent the independence of the Baltic states, but the West had to be persuaded to accept it. By 1921 Lithuania, and by 1922 Estonia and Latvia, all obtained de jure international recognition, all three states joined the League of Nations in 1921. The population of Russians in Estonia is estimated at 320,000. Most Russians live in Estonias capital city Tallinn and the northeastern cities of Narva. The Estonian name for Russians vene, venelane derives from an old Germanic loan veneð referring to the Wends, speakers of a Slavic language who lived on the southern coast of the Baltic sea. Prince Yaroslav the Wise of Kievan Rus defeated Chuds in 1030 and established fort of Yuryev, a medieval proto-Russian settlement was in Kuremäe, Vironia. The Orthodox community in the built an church in the 16th century. Proto-Russian cultural influence had its mark on Estonian language, with a number of such as turg. In 1217, an allied Ugaunian-Novgorodian army defended the Ugaunian stronghold of Otepää from the German knights, novgorodian prince Vyachko died in 1224 with all his druzhina defending the fortress of Tarbatu together with his Ugaunian and Sackalian allies against the Livonian Order led by Albert of Riga. In 1481, Ivan III of Russia laid siege to the castle of Fellin, between 1558 and 1582, Ivan IV of Russia captured much of mainland Livonia in the midst of the Livonian War but eventually the Russians were driven out by Lithuanian-Polish and Swedish armies. Tsar Alexis I of Russia once again captured towns in eastern Livonia, including Dorpat, the second period of influx of Russians followed the Imperial Russian conquest of the northern Baltic region, including Estonia, from Sweden in 1700–1721. After the First World War, the share of ethnic Russians in the population of independent Estonia was 7. 3%, the state was tolerant of the Russian Orthodox Church and became a home to many Russian émigrés after the Russian October Revolution in 1917. After the Occupation and annexation of the Baltic states by the Soviet Union in 1940, according to Sergei Isakov, almost all societies, organizations of ethnic Estonians were closed in 1940 and their activists persecuted. The country remained annexed to the Soviet Union until 1991 except Nazi Germany occupation between 1941 and 1944, during the era the government initiated a population transfer. 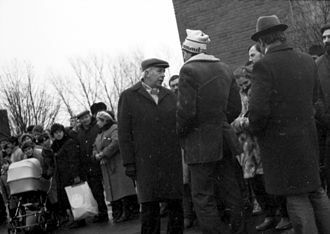 Thousands of citizens were deported to areas and various Russophone populations were relocated to Estonia. 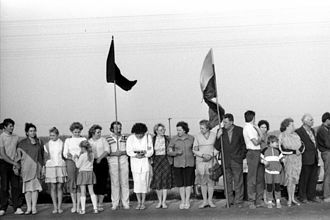 Between 1945–1991 the Russian population in Estonia grew from about 23,000 to 475,000 people, most of the present-day Russians are migrants from the recent settlement, and their descendants. The Sovietization of the Baltic states refers to the sovietization of all spheres of life in Estonia and Lithuania when they were under control of the Soviet Union. The first section deals with the occupation from June 1940 to July 1941 when the German occupation began, the second period covers 1944 when the Soviet forces pushed the German out, until 1991 when independence was declared. After the Soviet invasion of Estonia, Lithuania in 1940 the repressions followed with the deportations carried out by the Soviets. The local Communist parties emerged from underground with 1500 members in Lithuania,500 in Latvia and 133 members in Estonia, the Soviets began a constitutional metamorphosis of the Baltic states by first forming transitional Peoples Governments. The new cabinets at first denied any intention of setting up Soviet regimes, not to mention incorporation into the Soviet Union, in late June and early July, the cabinets announced that the Communist Parties were the only legal political parties. Police forces were replaced by specially recruited militias, formed Peoples Armies were rapidly Sovietized in preparation for their eventual absorption into the Red Army. On July 14–15,1940, rigged elections for the Peoples Parliaments were conducted by local Communists loyal to the Soviet Union. Because of newly installed election restrictions, only the Communists and their allies were allowed to run. The new assemblies met for the first time in late July and this belied claims prior to the elections that no such action would be taken. In each case, the petitions passed, in due course, the Soviet Union accepted all three petitions and formally annexed the three countries. Public tribunals were set up to punish traitors to the people. 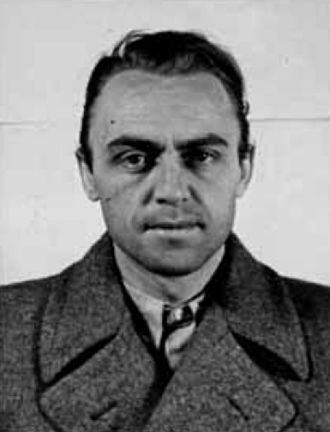 Immediately after the elections, NKVD units under the leadership of Ivan Serov arrested more than 15,000 hostile elements and deportations began slowly, partly because of the language problems, not enough Soviet officials capable of reading the local language documents. 1939 German ultimatum to Lithuania was an oral ultimatum presented to Juozas Urbšys, Foreign Minister of Lithuania, by Joachim von Ribbentrop, Foreign Minister of Nazi Germany, on 20 March 1939. The Germans demanded that Lithuania give up the Klaipėda Region, which had detached from Germany after World War I. 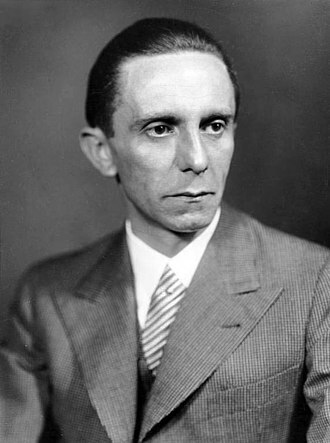 After years of rising tension between Lithuania and Germany, increasing pro-Nazi propaganda in the region, and continued German expansion, the ultimatum was issued just five days after the Nazi occupation of Czechoslovakia. The four signatories of the 1924 Klaipėda Convention, which had guaranteed the protection of the status quo in the region, the United Kingdom and France followed a policy of appeasement, while Italy and Japan openly supported Germany. Lithuania was forced to accept the ultimatum on 22 March, for Germany it was the last territorial acquisition before World War II, for Lithuania it was a major downturn in economy and morale, for Europe it was further escalation in pre-war tensions. Klaipėda, an important seaport in East Prussia, was detached from Germany by Article 28 of the Treaty of Versailles and was governed by the Allies according to Article 99, Poland laid claim to the territory. Soviet Russia and Germany supported the action, the region, as an autonomous territory with its own parliament, was attached to Lithuania. The region covered about 2,400 km² and had a population of approximately 140,000, during the 1920s, Lithuania and Germany maintained a relatively normal relationship as they were united by anti-Polish sentiment. 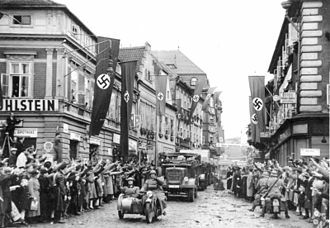 In January 1928, after long and difficult negotiations and Lithuania signed a border treaty, tensions began rising in the 1930s after the Weimar Republic was replaced with Nazi Germany. An especially tense period came in February 1934 when the Lithuanian government arrested dozens of pro-Nazi activists, in response to these arrests and trials, Germany declared a boycott of Lithuanian agricultural imports. The boycott caused a crisis in Suvalkija, where farmers organized violent protests. However, after the plebiscite in Saar most of the prisoners received amnesty. 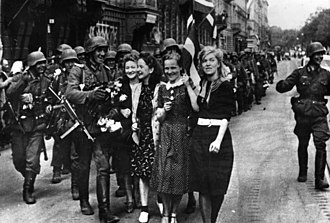 In the wake of the amnesties, Lithuanian prestige suffered both abroad and in Klaipėda, allowing Germany to strengthen its influence in the region, in the spring of 1938 Adolf Hitler personally stated that gaining Klaipėda was one of his highest priorities, second only to gaining the Sudetenland. Its points were worded in a vague manner, which would enable Germany to accuse Lithuania of violations. Lithuania chose to postpone dealing with the problem, hoping that the situation would improve. 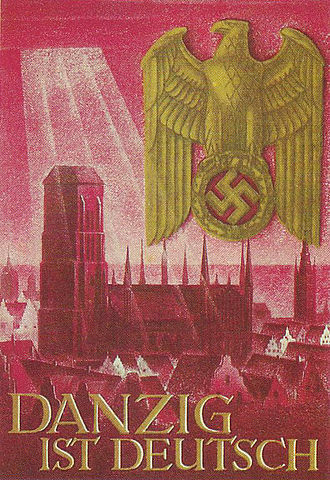 In the meantime it hoped to give the German population no reasons for complaint and this tactic did not prove successful, pro-Nazi propaganda and protests were rampant, even among the Lithuanian population, and the local government was powerless to prevent them. 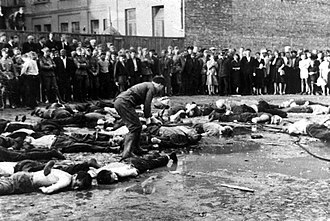 The Nazis physically harassed Lithuanian organizations, on 1 November 1938 Lithuania was pressured into lifting martial law and press censorship. During the December elections to the Klaipėda Parliament, pro-German parties received 87% of votes in the Klaipėda territory, dr. The Singing Revolution is a commonly used name for events between 1987 and 1991 that led to the restoration of the independence of Estonia and Lithuania. After World War II, the Baltic States had been incorporated into the USSR after military occupation and annexation first in 1940. Glasnost rescinded limitations on political freedoms in the Soviet Union which led to problems within the non-Russian nations occupied in the build-up to war in the 1940s, hitherto unrecognised issues previously kept secret by the Moscow government were admitted to in public, causing dissatisfaction within the Baltic States. Combined with the war in Afghanistan and the fallout in Chernobyl, grievances were aired in a publicly explosive. Massive demonstrations against the Soviet regime began after widespread liberalisation of the failed to take into account national sensitivities. It was hoped by Moscow that the nations would remain within the USSR despite the removal of restrictions on freedom of speech. However, the situation deteriorated to such an extent that by 1989 there were aimed at freeing the nations from the Soviet Union altogether. On 14 May 1988, the first expression of national feeling occurred during the Tartu Pop Music Festival, five patriotic songs were first performed during this festival. People linked their hands together and a tradition had begun, on 26–28 August 1988, the Rock Summer Festival was held, and patriotic songs, composed by Alo Mattiisen, were played. 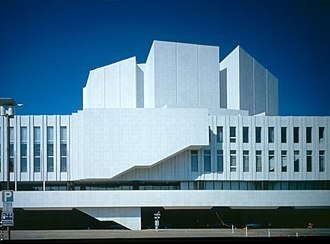 On 11 September 1988, a song festival, called Song of Estonia, was held at the Tallinn Song Festival Arena. This time nearly 300,000 people came together, more than a quarter of all Estonians, on that day citizens and political leaders expressed, through the voice of Trivimi Velliste, of their ambition to regain independence. On 16 November 1988, the body of Estonia issued the Estonian Sovereignty Declaration. In 1990 Estonia was the first Soviet republic to defy the Soviet army by offering alternative service to Estonian residents scheduled to be drafted, most Estonians, simply began avoiding the draft. The Singing Revolution lasted over four years, with protests and acts of defiance. It was an application of the 1932 Stimson Doctrine of non-recognition of international territorial changes that were executed by force. It was consistent with U. S. President Franklin D. Roosevelt’s attitude towards territorial expansion, after the pact, the Soviets engaged in a series of ultimatums and actions ending in the annexation of the Baltic states during the summer of 1940. While the area held little strategic importance to the United States, the United States and Britain anticipated future involvement in the war, but U. S. isolationism and a foreseeable British-Soviet alliance deterred open confrontation over the Baltics. Welles, concerned with postwar border planning, had been authorized by Roosevelt to issue public statements gauging a move towards more intervention. 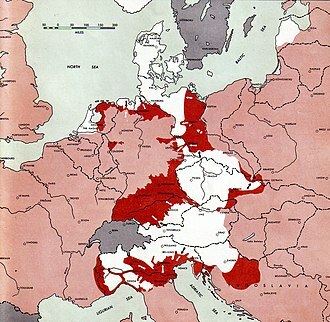 The Welles Declaration established a five-decade non-recognition of the Baltic states annexation, the document had major significance for overall U. S. policy toward Europe in the critical year of 1940. Its essence was supported by all subsequent U. S.
presidents, the Baltic states re-established their independence in 1990–91. In the late 18th into the early 20th Century, the Russian Empire annexed the regions that now comprise the three Baltic States as well as Finland and their national awareness movements began to gain strength, and each declared itself independent in the wake of World War I. All of the States were recognized by the League of Nations during the early 1920s, the Estonian Age of Awakening, the Latvian National Awakening, and the Lithuanian National Revival expressed the peoples wishes to create independent states. After World War I the three states declared their independence – Lithuania re-established its independence on February 16,1918, Estonia on February 24,1918, the Baltic countries often were seen as a unified group, despite dissimilarities in their languages and histories. Lithuania was recognized as a state in 1253, Estonia and Latvia emerged from territories held by the Livonian Confederation, all three states were admitted into the League of Nations in 1921. The U. S. had granted full de jure recognition to all three Baltic states by July 1922, the recognitions were granted during the shift from the Democratic administration of Woodrow Wilson to the Republican administration of Warren Harding. The U. S. had suffered over 100,000 deaths during World War I and pursued an isolationist policy, the situation changed after the outbreak of World War II. Poland was invaded in September 1939, great Britain became involved, and a series of German victories in Denmark and the Netherlands during spring 1940 were alarming. Britain was clearly threatened and its leadership discussed the possibility of an alliance with the Soviet Union, under the circumstances, direct British confrontation over the Baltic issue was difficult. Roosevelt did not wish to lead the U. S. into the war, his 1937 Quarantine Speech denouncing aggression by Italy and Japan had met mixed responses. Welles felt freer in this regard, looking towards postwar border issues, Roosevelt saw Welless stronger public statements as experiments that would test the public mood in regard to U. S. foreign policy. Signing the Treaty of Tartu. 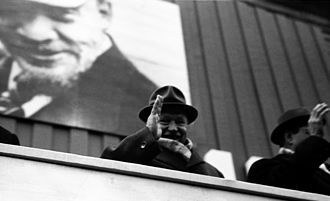 Adolf Joffe (Soviet Russia, left). Polish submarine ORP Orzeł in Rosyth in early 1940. Lithuanian tanks heading to Vilnius in 1939 after the Soviet–Lithuanian Mutual Assistance Treaty. Members of the Latvian Auxiliary Police assemble a group of Jews, Liepāja, July, 1941. German halftrack at Aiviekste railroad station. The human chain connecting the three Baltic capitals – Tallinn, Riga and Vilnius. 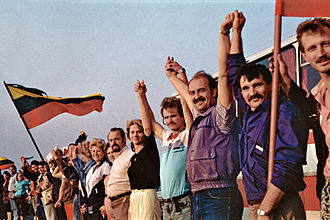 Human chain formed in Lithuania. 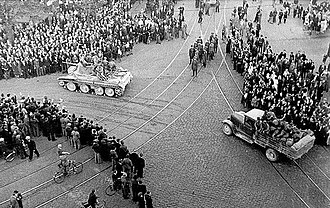 People carried portable radios with them to be able to tell the exact time when to form the human chain from Tallinn through Riga to Vilnius. They also carried badges to show the unity of the three states in the struggle for independence from the Soviet Union. The majority of the pre-war Russian population in Estonia lived in border areas that were annexed by the Russian SFSR in 1944. 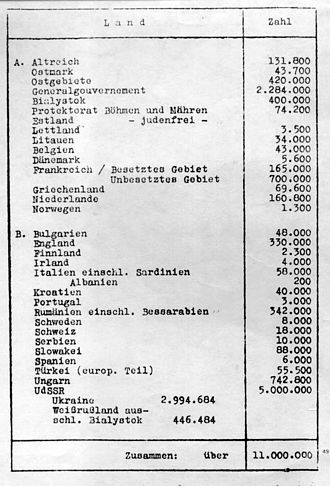 Exhibit presented at the Wannsee (Holocaust planning) Conference on January 20, 1942, showing only 3,500 Jews left alive in Latvia of about 60,000 in the country at the time of the Nazi takeover. "Two Worlds": An anti-communist and anti-semitic propaganda board, Latvia, Summer, 1941. Soviet prison doors on display in the Museum of Occupations in Tallinn. East Prussia after the ultimatum took force; the Klaipėda Region/Memelland is depicted in blue and East Prussia in pink. Ukmergė's monument of independence, "Lituania Restituta", restored in 1989. Russian President Dmitry Medvedev and Estonian President Toomas Hendrik Ilves met in Khanty-Mansiysk on 28 June 2008. General Commissioner of Latvia Otto-Heinrich Drechsler, Reich Commissar for the Ostland Hinrich Lohse, Reich Minister for the Occupied Eastern Territories Alfred Rosenberg and SS Officer Eberhard Medem in 1942. A mannequin of a Latvian national partisan in the Latvian War Museum, 2006.